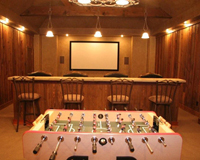 DM Home Entertainment is the choice Cinema Integrator for the owner Cinemark Movie Theaters, Lee Roy Mitchell. When the owner of theaters selects us as the cinema designer and integrator for both his Dallas home and vacation home – that says a lot. 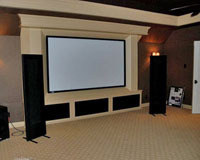 From blueprints to final audio and video calibration, DM Home Entertainment can integrate your entry level basic system all the way to the finest in room acoustics and equipment. Click here to visit the Home Cinema portfolio. DM Home Entertainment will design a solution that meets your needs. We offer audio systems out by the pool that are installed into the landscape so that they disappear. 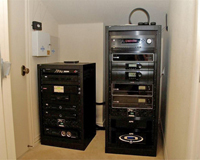 We utilize equipment closets for the gear, (Satellite boxes, DVD players, amplifiers and more) so that we can install TVs on the wall throughout the house without any other equipment located in the rooms. Simple and clean installations. Click here to visit the Home Audio & Video portfolio. Lighting systems installed just as easily in retrofit installations as in new construction. We have homes with over 180 lights on automated systems. Unlimited number of light scenes. Control each dimmer or switch just as you would any other dimmer….but control the whole house with one button. Simple to add and grow with your needs. Start with a simple 10 switch system for entry lights, landscape lights, kitchen and master bedroom. Add the family room and media room later. Then at Christmas time add an outlet dimmer to your tree lights and outdoor lights. Simple and can evolve with your needs. Adding cameras and DVR is easy. For example, you would like the camera feed on your TV then on your 7 inch touchpanel in your kitchen or master bedroom. Then add a view of the cameras while you are in Hawaii on vacation. It is nice to know that when your home Security system goes off you can receive a text page to your phone. Then from any computer connected to the internet you can connect to your camera system via a secure VPN connection. If you find it is just a neighbor checking on your dog, you can reset the alarm and confirm things are okay by looking at the cameras…..all while you are hundreds of miles away and connected. Replace your thermostats, no control wire needed. You now have a great way to GO GREEN! Left the house on vacation and forgot to adjust the heat or air while you are gone – no problem, just log onto any computer connected to the internet and make the adjustment from anywhere. Want to get a text page if your kids get home from school and crank the air down to 72 degrees – we will program that into your Control4 system. It is not just for the super rich. 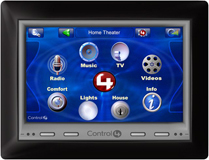 For just $300 you can add to your Control4 system the ability to know if your garage door is closed. If you find that it is not you can use your Control4 system to close it. Want to make sure it is closed? We can connect to your system remotely and add the programming that your garage door should be closed when the sun is down. The Control4 system, because it is connected to the internet and knows you latitude and longitude of your house, knows what time the sunsets and rises. We program the system to shut the door at sunset every day and check it every 20 minutes. If your kids leave a bike in the way and the door cannot shut – the system will send you a text page letting you know of the obstruction. We wired over 600 homes last year anywhere from 1,200 square foot lake houses to 14,600 square foot estates. 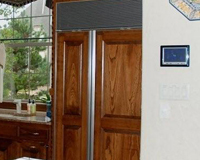 Structured wire systems allow you to take advantage of the newest technology that is being used in homes. This technology is as simple as the doorbell making your phone system ring, so when you answer you can have a full 2-way conversation with the person at the front door, all the way to High Definition satellite TV, cameras, phone, computer networks and gate access. The earlier we are involved in the project the more value we bring to you and the homebuilder. See before/after examples. 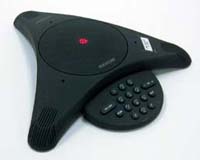 Office Audio systems, Camera systems, PBX phone systems and Ethernet Networks. The lines are being blurred between what is commercial and residential. We have projects in Lincoln Center at LBJ and The Dallas North Tollway for a high end bond brokerage. Board Rooms with seating for 80 that need the ability to teleconference and connect computers to the internet. Or Collin County Community College that needs classroom audio video solutions. We will find the right solution for the project. 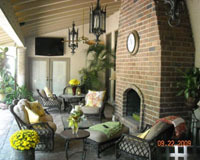 Outdoor living space has become as important as the family room. Watching the big game while sitting by the fire. Listening to music while you are barbequing by the pool. You want easy to operate and durable solutions that make it more fun to be outside. We do too! Click here to visit the Outdoor Living portfolio.